Though dozens of hybrid models are available for sale in the United States, the vast majority are sedans. Still, there are a handful of options for consumers in search of both fuel economy and passenger and cargo room. Based on the latest sales numbers, here are the five top-selling hybrid SUV options. 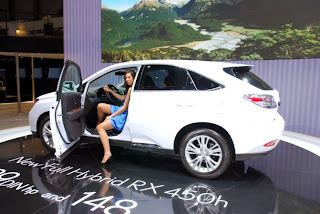 The Lexus RX 450h is currently the most fuel-efficient hybrid SUV on the market at 30 mpg combined fuel economy (32 mpg in city and 28 on the highway.) The crossover SUV’s combination of luxury and efficiency has proven to be a winner with consumers, selling twice as many units so far this year as the next most popular hybrid, the Toyota Highlander hybrid (which happens to be built on the same powertrain and chassis as the RX.) The 450h features all of the amenities that you would expect in a Lexus. It starts at $46,310. Despite being built on the same platform as the Lexus RX 450h, the Toyota Highlander Hybrid achieves 2 mpg less in combined fuel economy than its luxury cousin, according to the EPA, netting 28 mpg on the highway and in the city. The Highlander Hybrid starts at just over $40,000 and doesn’t come with as many standard upmarket features as the RX. But it does offer one crucial feature that may make it the more desirable of the two SUVs for many large families: a third row of seats. The Highlander’s foldable third row gives it a leg up over other competing hybrid crossovers. With a price tag just shy of $70,000, the Porsche Cayenne S Hybrid is not exactly a bargain. In fact, compared to its gas and diesel platform mates, the Cayenne hybrid doesn’t achieve particularly impressive fuel economy. At 20 mpg in the city, 24 mpg on the highway and 21 mpg combined, the S Hybrid barely beats out the base model Cayenne (15 mpg city, 22 mpg highway) and falls short of the turbo diesel’s 23 mpg combined rating. The saving grace of the Cayenne Hybrid lies in its style and performance. The SUV is tuned to provide more power and torque than either the base model or the diesel Cayenne, netting a meaty 380 horsepower thanks in part to its 47-horsepower hybrid-electric motor. The Audi Q5 Hybrid is a close competitor to the Lexus RX 450h in both price and efficiency. The Q5 starts at $50,900, boasts 26 mpg in combined fuel economy (24 mpg in the city, 30 mpg on the highway) and has plenty of luxury flourishes like standard leather seats, a navigation system and high-end speakers. Still, the Q5 hybrid lags behind the new 2014 Q5 diesel in fuel economy and price, starting about $4,400 higher. A hybrid electric car combines an internal combustion engine with batteries and an electric motor to provide high fuel economy. Hybrids automatically switch between gas and electric to maximize efficiency. 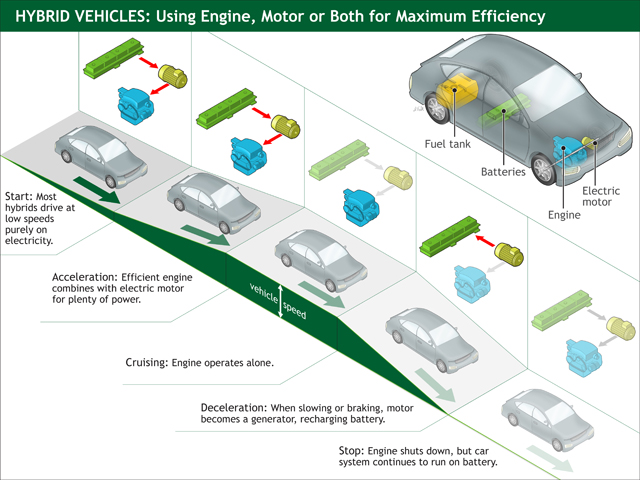 Batteries are charged by the engine and during regenerative braking.